If there is any one concept that defines this issue it is “normality”. Jason Aaron does such a wonderful job of showing an ordinary day in the life of Thor when he is on Midgard. He meets new people, he makes their lives better, he comforts them, gives them hope, he stands by them, he shows them wonders, and so on. In short, he is a true hero in every sense of the word, because he cares about the little guy, the ordinary little guy that others ignore. Very much a Green Arrow-like mindset, going off the character’s portrayal in Justice League Unlimited (which is the only version I know other than the one in Smallville, which was a bit high-brow, and the one in Arrow, which largely deals with the bigger problems facing Starling City). Another thing is the emotion in the entire issue. Till now, Jason impressed me with all the characterisation and the action. Now, he impresses with introspection and emotion. One of the very first things that Thor does on his return to Midgard is to go see a prisoner facing execution, and he brings him the last fruit from a world that has been scoured and burned. The emotions in those scenes are just heart-breaking. I don’t know who Fulton is, but whoever he was before, meeting Thor has clearly changed his perspective on life. It was such a great emotional beat. Then there are all the little things, such as Thor making it rain in a desert/plains to help a poor farmer family, or sharing a beer with servicemen, or helping a fishing trawler through some tough times, or meditating with the Dalai Lama, and so on. Its all so… heroic on a basic level. He is looking to make a difference in the lives of these people, and receiving the joy of the effort in turn. And that brings me to the final section of this comic, Thor meeting Jane Foster again. Since I’ve not read any Thor comics prior to this series, outside of Matt Fraction’s The Mighty Thor Volume 1, I don’t know how things stand between Thor and Jane. Given this issue however, it appears that Jane is now seeing someone else, and that in fact she is undergoing chemo-therapy for breast cancer. That was doubly heartbreaking for the simple reason that my mother just had breast cancer surgery and has begun her chemo-treatments. Thor’s reaction mirrors my own, the horror and helplessness of it. And without giving her any kind of an action scene or anything, Jason Aaron makes Jane into, as Thor himself says, “You are a brave woman, Jane Foster”. What more needs to be said after that? The issue ends with one of the most breathtaking visuals in comics: a sunrise like nothing else. Which brings me to the art side of this issue. Nic Klein seems to have stepped up for a guest issue as writer while series regular Esad Ribic takes a break. While I deeply miss Esad’s pencils and Ive Svorcina’s colours, Nic seems to have done a pretty darn good job nonetheless. 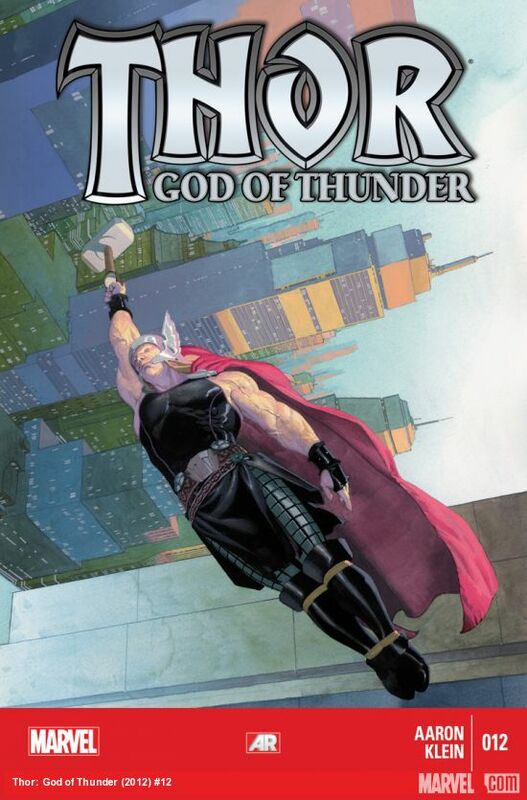 His Thor is a bit more Hollywood action-hero, kind of like how Dolph Lundgren would look as Thor in full get-up, and the overall colour palette of the issue is a bit heavy on shadows and black inks. But still, I enjoyed this issue’s artwork. It brings… diversity, and its of the good kind, so I don’t mind it at all. Plus, his Jane Foster is really great. And of course, Esad Ribic’s fantastic cover is just that, fanfrikkintastic. Overall, an excellent job by the entire team and I can’t wait for #13!! Posted on September 2, 2013, in 2013 Reading Challenge, 2013 Writing Challenge, Challenges, Comics Reviews, Review Central and tagged 2013 Reading Challenge, 2013 Writing Challenge, Challenges, Comics, Comics Reviews, Esad Ribic, Marvel, Marvel Now, Midgard, Nic Klein, Norse Mythology, Review Central, Space Opera, Thor, Thor: God of Thunder. Bookmark the permalink. 6 Comments.